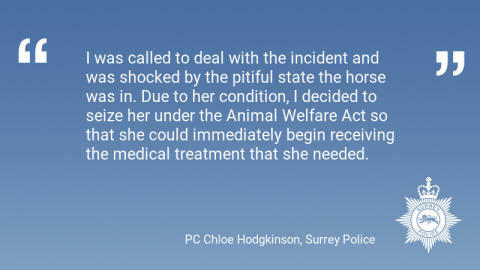 A man has pleaded guilty to causing unnecessary suffering to an animal after officers seized a horse from a field in Chertsey in May 2018. Maurice Smith, 30, was charged under the Animal Welfare Act after evidence emerged of how he had subjected the horse to prolonged neglect and ill-treatment, which had left her in extreme distress. Smith was given a 12 month community order, ordered to carry out 120 hours of unpaid work and was ordered to pay £400 court costs and an £85 victim surcharge when he appeared at Staines Magistrates’ Court last Wednesday (3 April). A number of witnesses initially contacted police in April 2018 to report that the horse, April, was in distress. She had been left double rugged in temperatures of 24 degrees without shade and was sweating profusely. PC Hodgkinson added: “April has since received the care and treatment that she needed and is making a good recovery. I hope that this case will deter other owners from neglecting their animals and send a strong message that if you are caught, you will be dealt with."